To compare the differences in occurrence rates, time intervals, main causes, and management strategies of early unplanned reoperations (EUROs) after gastrectomy for gastric cancer (GC) between laparoscopic and open surgery. From Jan. 2005 to Dec. 2014, 2608 and 1516 patients underwent laparoscopic-assisted gastrectomy (LAG) and open gastrectomy (OG), respectively. Perioperative outcomes and risk factors for EURO were analyzed. The overall EURO rate was 1.3%, and the rate in LAG and OG groups was 1.1% and 1.6%, respectively. The EURO rate after 24 h postoperatively was significantly lower in LAG group than in OG group (p = 0.019). 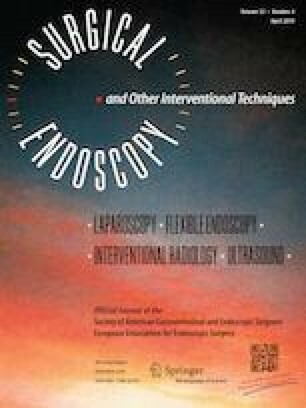 No significant correlation was identified between laparoscopic surgery and EURO rate (p = 0.157); age > 70 (p = 0.028), body mass index (BMI) > 25 kg/m2 (p = 0.009), and estimated blood loss > 100 ml (p = 0.029) were independent risk factors for EURO. The main cause of EURO was intra-abdominal bleeding, anastomotic bleeding, and anastomotic leakage in LAG group; and intra-abdominal bleeding, anastomotic leakage, and intestinal obstruction in OG group. The proportion of patients with intra-abdominal bleeding requiring EURO was markedly higher in LAG group than in OG group (p = 0.043). Transverse mesocolonic vessels and spleen were the most common bleeding sites necessitating EURO in LAG and OG groups, respectively. Six of 28 (21.4%) patients with EUROs in LAG group underwent laparoscopic procedure (p = 0.025). Mortality in patients requiring EURO was 3.6% and 20.8% in LAG and OG groups, respectively (p = 0.084). Compared to open surgery, laparoscopic surgery does not increase the incidence of EURO in patients undergoing gastrectomy for GC; however, laparoscopic surgery is associated with a lower EURO rate after 24 h postoperatively and a higher proportion of patients with intra-abdominal bleeding requiring EURO than open surgery. Effective and accurate intraoperative hemostasis for intra-abdominal vessels and anastomotic sites will help further reduce the incidence of EURO following LAG within 24 h postoperatively. The online version of this article ( https://doi.org/10.1007/s00464-019-06722-0) contains supplementary material, which is available to authorized users. This work was supported by the Scientific and technological innovation joint capital projects of Fujian Province (No. 2016Y9031); the second batch of special support funds for Fujian Province innovation and entrepreneurship talents (No. 2016B013); Natural Science Foundation of Fujian Province (No. 2016J01463); Construction Project of Fujian Province Minimally Invasive Medical Center (No. 171); and Fujian science and technology innovation joint fund project (No. 2017Y9004). Drs. Ping Li, Jian-xian Lin, Ru-hong Tu, Jun Lu, Jian-wei Xie, Jia-bin Wang, Qi-yue Chen, Long–long Cao, Mi Lin, Ze-ning Huang, Ju-li Lin, Chao-hui Zheng, and Chang-ming Huang have no conflicts of interest or financial ties to disclose.